Home / Engagement rings: Custom Design / Three Stone Rings / “Reflection” perfect Emerald cut diamond symmetry. “Reflection” perfect Emerald cut diamond symmetry. Emerald cut diamond ring with baguette brilliant cut shoulder diamonds. Central to this design is an emerald cut diamond set in place with 4 triangular claws. The diamond is flanked on each side with “baguette brilliant” cut shoulder stones. This ring was of large size at almost 3 ct and therefore would not be in everyone’s price range “as shown”. 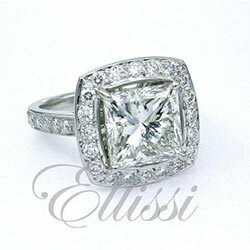 However, it is possible to make this ring in differing diamond sizes so as to accommodate different budgets.